The coming together of customs, objects or philosophies that are inherently old school, with the flexible, and the often times more convenient, capability of present day technology, can create juxtapositions that might feel odd at first, prompting the question of “Why not just pick one way or the other?” Still, that has not stopped developers from mashing up the best of both worlds where many forms of entertainment are concerned. Record players have slots to allow for conversion to mp3 format, e-readers give ‘the look of normal paper’ but condense things down to a single flat device over a stack of books, cameras hold dozens of filters rather than inspiring people to tinker and experiment to get a color naturally –and the list goes on. Despite the examples given, that does not mean the marriage of an activity’s “original” or “natural” feel and the boost provided from hard drives or large bandwidth is not without its appeal. The reason so many of these pairings work and are not simply created for a pointless show of stark opposition, is mostly due to one underlying aspect: access. Digitizing has allowed for so much – books, pictures, sounds – to be stored in droves larger than ever before in history, without needed to take up the equivalent amount of tangible space in the real world. Of course, the build up of continuously outdated electronic devices is another matter of physical accumulation with its own set of problems but, for the aforementioned art forms, having a near infinite space to create and then save work is a gift of matching, near infinite, value. The creation of music using digital support is nothing previously unheard. Programs like Finale, Sibelius, Cakewalk, Reason and Logic, among others, have been around for many years and helped musicians, even when the average desktop computer setup did not have much to offer past a few basic MIDI patches, a single mode of input for notation and lots of bugs when it came to editing and or the ever-important element of saving. However, even having come leaps and bounds since each of these programs’ first versions, there is always a feature, a method of working, that could be implemented (better) for a songwriter out there who regularly blends their smart phone recorder with their pencil drumming/humming/whistling habit. This is where one of the major tablets on the market, the Windows Surface, has stepped up its game and found the perfect niche for highlighting the usefulness of the Surface Pen –a long promoted, but up to now still somewhat slowly received, feature that may just find a solid second wind with the Surface Pro 3. The confidence inspired by this prediction: StaffPad for Windows. 1) Running out of paper or not having paper on hand when needed at the moment inspiration strikes. Plenty of people have their own shorthand –dashes in place of full note heads being one of the most common. Here is where StaffPad shines because, every slash of a note head become properly converted to standard score. Dynamic markings, expressions and even just free form notes can be easily written in without interfering with the score itself, thanks to separate data layering. The quality of playback is held in high regard as well, with a scrupulously recorded bank of orchestral samples from wold-class groups like the Boston Pops (among others) programmed into StaffPad, for as realistic as possible playback of scores. A variety of other seemingly small but potentially very tedious tasks (e.g. transposition, changing stem direction, adding/moving/deleting repeat bars, codas, a Dal segno, etc.) These can be tackled and edited with quick, natural gestures using the Surface Pen and will save the need for multiple copies if one forgets or decides after a lot has been written out, to make a massive change to their music. Then when it comes to saving, Windows OneDrive system is available for easy auto-syncing and saving so the dreaded “loss of everything” becomes a non-issue and work becomes accessible from any synced device. The most important and initially most impressive component of StaffPad however, is its level of music recognition. Despite the possibility for a person’s shorthand to be as messy as, well, shorthand, the app has a high level of accuracy that up to now, has not been seen as a steadily holding norm among its music notation predecessors. The intuitive action of writing out a measure and simply moving to the next bar, only to see what was just written transform before one’s eyes, is probably the most fun and gratifying aspect to StaffPad. Seeing the app in action and hearing what it can do really makes the technology of even just five, to say nothing of 10 years ago, feel galaxies away from what these innocent looking devices allow users to do. High school students and collegiate music majors are bound to be a big market demographic for this program among their professional composer peers. The only caveats to StaffPad are its required use of Windows 8.1 with support of the digitizer pen and touchscreen. This is no surprise mandate though, given the power of StaffPad lies almost entirely with its natural mode of compositional input. A price tag of $69.99 might feel stiff for an “app” but really, just because StaffPad was made for a mobile device, what musicians and educators can do with it puts this program far outside the realm of any five dollar “app of the week” and its usefulness has the potential to carry on for years after purchase; easily paying for itself in un-purchased notebook paper and pencils alone or possibly even putting a small dent in one’s electric bill from not needing to run the massive studio desktop all the time when writing. 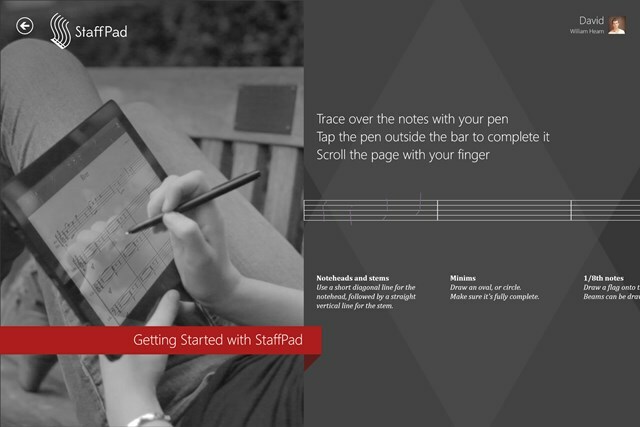 Learn more about StaffPad from the company’s blog and those interested in a copy of the program can download it now from the Windows Store. The Disability Film Challenge kicks creativity into high gear!